Pictured, from left, are Merri Bottorff and Major Trish Welch. 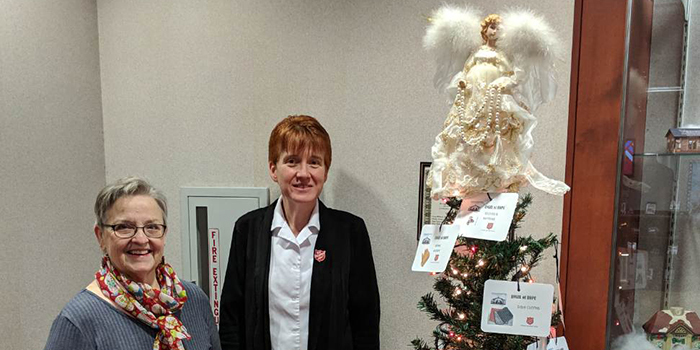 KOSCIUSKO — The Salvation Army had three Angel of Hope trees in Warsaw this holiday season to collect items for Kosciusko families in crisis throughout the year. Trees were located at K-Mart, Winona Lake Free Methodist Church and the Warsaw Public Library according to Major Trish Welch, corps officer. Donors take tags off the tree to purchase, towels, socks, gloves, underwear and other items that would be needed if there was a family fire or other emergency. The Salvation Army piloted the program in December 2017 with a tree at the Warsaw Public Library and help from Merri Bottorff, Salvation Army Women’s Auxiliary member and volunteer at the Library. Items are collected and then placed in plastic storage boxes when given to those in need. “We plan on having quarterly collections for items for the boxes but donations are accepted any time,” noted Welch.